"Retvenko leaned against the bar and tucked his nose into his dirty shot glass. The whiskey had failed to warm him. Nothing could get you warm in this Saintsforsaken city. And there was no escaping the smell, the throat-choking stew of bilge, clams, and wet stone that seemed to have seeped into his pores as if he’d been steeping in the city’s essence like the world’s worst cup of tea." "'What am I doing here?'" That thought had run through Wylan’s head at least six times a day since he’d met Kaz Brekker. But on a night like this, a night when they were “working,” it rose and fell in his head like a nervous tenor practicing his scales: WhatamIdoingherewhatamIdoingherewhatamIdoinghere." Find an excerpt of the first four chapters here. This sounds so good! 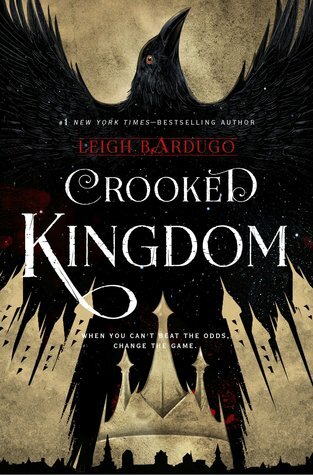 I really want to read Six of Crows and now I have another book to get excited about as well. :-) Thanks for sharing.